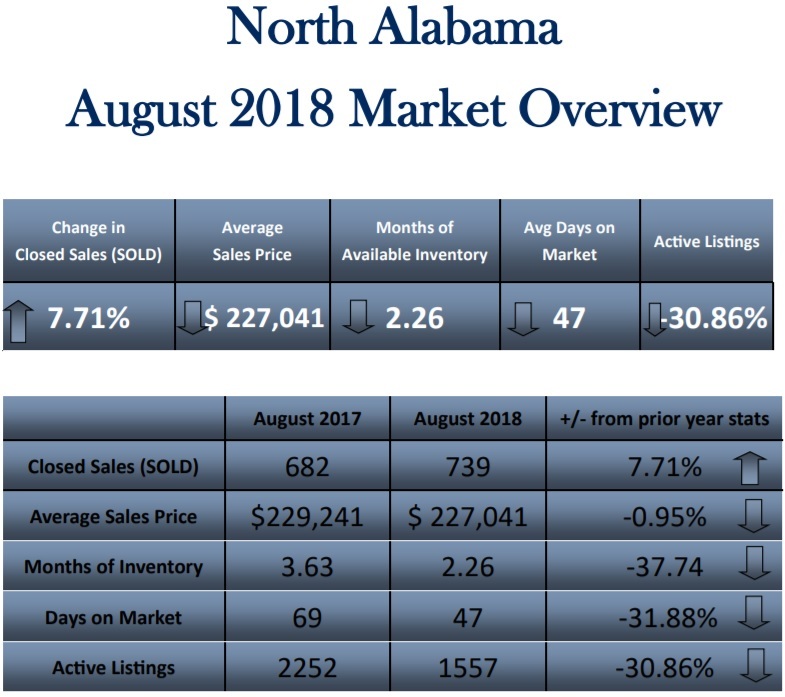 What has changed in our North Alabama real estate market since last year? Let’s review the latest statistics. 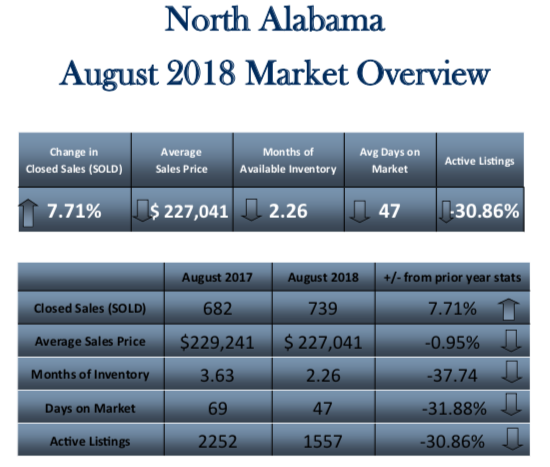 The numbers are in for Huntsville’s August 2018 real estate market, and, as usual, we wanted you to be the first to see them. In comparing last year’s statistics to this year’s, we are continuing to see an increase in sales, while seeing a decrease in the amount of available inventory. Our North Alabama market hit an astounding 739 residential home sales this August, representing a 7.7% increase from this time last year. The average days on market, meanwhile, dropped to just 47 days. This constitutes a 31% year-over-year decrease. Another notable development is the fact that, for the first time in a few months, our average sales price dipped, going down 1% from $229,00 to $227,000. Finally, with less than 2.5 months’ worth of available inventory, we are still in a strong seller’s market. You can see a more detailed breakdown of these important figures from our market by referencing this chart. This is a great time to get your home sold, but our changing market still presents unique challenges. To succeed with your real estate goals, you will need to partner with an experienced real estate professional who knows how to navigate these conditions and who can market your home globally, not just locally. If you have any other questions, would like more information, or would like our team’s help with buying or selling a home, feel free to give us a call or send us an email. We look forward to hearing from you soon.